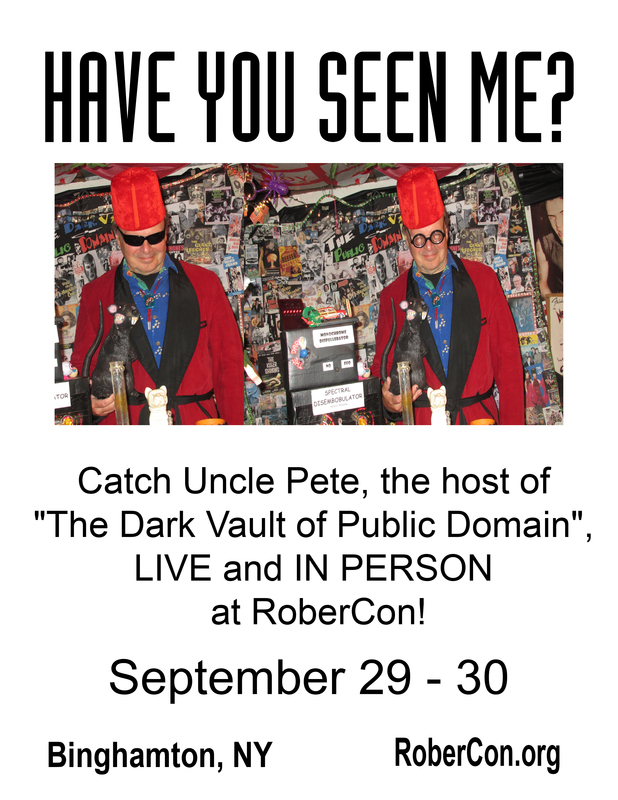 Thus Saturday and Sunday, September 29th and 30th, UNCLE PETE will be appearing at The RoberCon – Sci-Fi and Board Game Convention! It runs from 9:30am – 5pm both days and UNCLE PETE will be at THE DARK VAULT OF PUBLIC DOMAIN table both days. In addition, UNCLE PETE will be hosting a panel discussion each day at 1pm to talk about THE DARK VAULT and about horror hosts in general. There’ll be lost of fan tables and vendors and all kindsa fun stuff. See all the details at RoberCon – Sci-Fi and Board Game Convention or at Uncle Pete Official on Facebook. See Uncle Pete in the daytime – and that’s not something that happens very often! ~ by UNCLE PETE on September 28, 2018.